Salmon Fishing Lodge, Queen Charlotte Islands, BC. Queen Charlotte Lodge, Naden Harbour, British Columbia. At Queen Charlotte Lodge, off the northcoast of British Columbia, we offer more to those seeking the ultimate sport fishing adventure! Located in the gateway to the North Pacific, our Queen Charlotte Island (Haida Gwaii) fishing grounds offer a wealth of opportunity to anglers. This is the perfect habitat for hungry salmon just beginning their homeward migration. 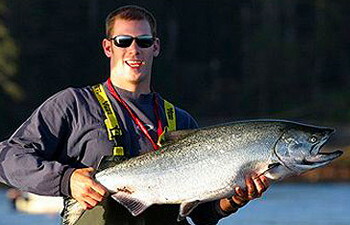 Sheltered from the open Pacific, these BC fishing grounds produce an abundance of sportfish that rivals any locale on the coast. The waters of our Queen Charlotte fishing grounds are legendary for their abundance of huge chrome Chinook salmon and bright silver Coho. Halibut, Lingcod and groundfish provide plenty of variety to round out the experience! Our professional fishing guides are carefully selected and trained to ensure you enjoy your fishing experience to the max. At Queen Charlotte Lodge we also provide you with the opportunity to fish on your own if you prefer. 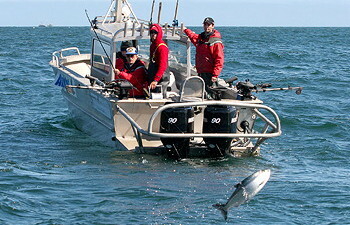 Our fleet of 17 foot custom-built fishing boats is the key to the long time popularity of our non-guided program. You may also wish to take advantage of the opportunities that abound to fish for Coastal Cutthroat Trout and "Sea-run" Dolly Varden during a visit to Queen Charlotte Lodge. The saltwater estuary environment fed by the many streams flowing into Naden Harbour provides a truly unique fishing experience! Our Main Lodge sets the standard for comfortable accommodation, warm friendly atmosphere and genuine hospitality. The Charlotte House is great for corporate or family groups who would like a more private program. It offers exclusive features to ensure your fishing getaway is everything you'll want it to be. Totem House, features the utmost in comforts and amenities together with a private Chef and Hostess. Four generous and luxuriously finished suites are on the upper level of this spectacular log chalet. 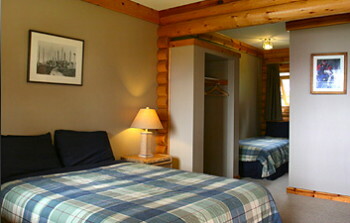 Set up for the comfortable enjoyment of 8 guests, Haida House offers a private getaway for group meetings or family adventures. Four bedrooms and 3 bathrooms plus the comforts of the private hot tub and satellite TV make guests feel right at home. 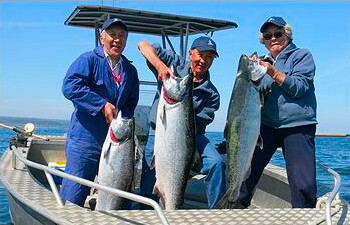 Masset House is perfectly positioned right on the waterfront in Masset Harbour, and this comfortable cedar facility operates throughout the year, focusing on wild Steelhead throughout the winter. 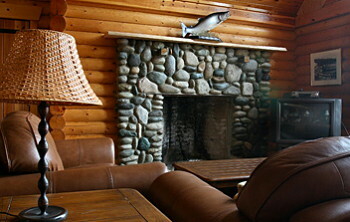 After the fishing day has ended the lounge is the place for guests to share the tradition of telling fishing stories! At Queen Charlotte Lodge we believe that the dining experience should be as memorable as the fishing! Our Chef and staff work tirelessly to provide you with delicious BC Westcoast creations you'll talk about when you get home! And, for the ultimate in relaxation enjoy a soothing massage at the lodge. Whether in the Lodge, on the dock or on the water, our staff is always happy to be of assistance. We pride ourselves in the comfort, friendliness and attention to detail of our services so when you visit you'll see we've thought of everything. Whichever your preference of accommodation, fishing or adventure at the Queen Charlotte Lodge, we have the British Columbia destination to call home for a few days! BC Salmon Fishing Lodge, Queen Charlotte Islands. 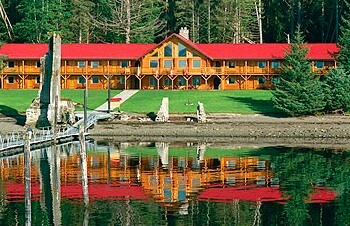 Queen Charlotte Lodge, Naden Harbour, British Columbia.